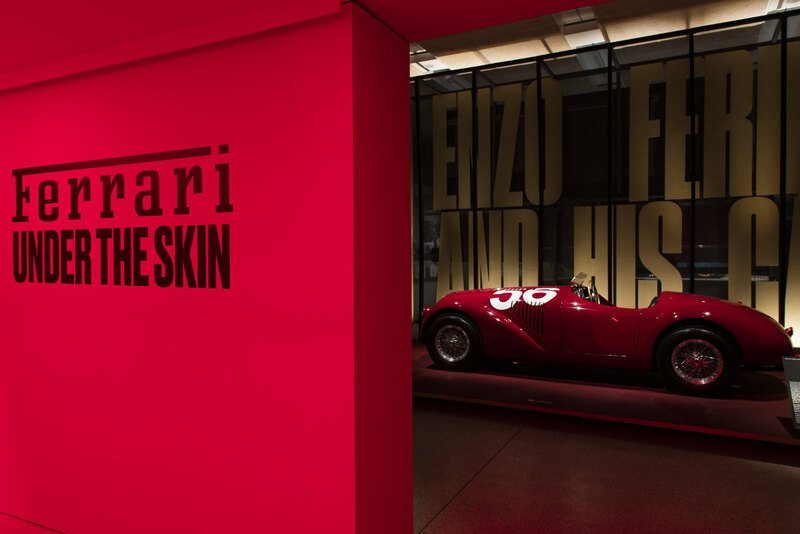 As revealed in Lucire in September, the Design Museum has opened its exhibition celebrating Ferrari’s 70th anniversary, called Ferrari: under the Skin. We can now see inside the exhibition and some of the most coveted Ferrari models in history. The cars are worth £140 million. The exhibits include original drawings, and Enzo Ferrari’s driving licence. As noted in September, There is an exact replica of the first Ferrari, the 1947 125 S, built in 1987; a 1950 166 MM; a 1952 500 F2 racing car, the type that took the Formula 1 championship in 1952 and 1953; a 1957 250 GT chassis; a 1957 250 GT cabriolet formerly owned by British racing driver Peter Collins; a 1960 250 GT Berlinetta passo corto short-wheelbase, driven by Stirling Moss in the 1960 Tourist Trophy; a 1961 250 GT Berlinetta passo corto ‘Sperimentale’, regarded as a transition between the 250 GT and 250 GTO; a 1962 250 GTO, possibly Ferrari’s most iconic model masterminded by Giotto Bizzarrini, and which won the over-2000 cm³ class of the FIA’s International Championship for GT Manufacturers in 1962, 1963 and 1964; a 1967 275 GTB/4; a 1973 365 GTB/4, usually referred to as the Daytona; a 1986 Testarossa Spider commissioned by Fiat boss Gianni Agnelli; a 1988 F40 owned by Pink Floyd’s Nick Mason; a 2000 F1-2000 driven by Michael Schumacher; and a 2016 LaFerrari Aperta owned by Gordon Ramsay, which blends hybrid and Formula 1 technology. The exhibition runs till April 15, 2018. The Design Museum is open daily from 10 a.m. to 6 p.m., with the last admission at 5 p.m. Cost of entry is £18 for an adult, £29·30 for a family of one adult with three children; £41 for a family of two adults and three children; £9 for a child aged six to fifteen; and children under six and members enter free. An exhibition catalogue will be available in the Design Museum Shop for £39·95.